What a weekend! The weather Saturday was amazing and facilitated long-distance trips to some Toronto booksellers I don’t usually have the pleasure of visiting. They were very nice about letting me photograph some books and even nicer about letting me buy some, and a very good time was had by all involved. My eight-month-old was awarded the “best behaved baby” award in two bookstores before having a total meltdown at the Lillian H. Smith branch of the Toronto Public Library, requiring my husband to have me paged from where I was hiding on the fourth floor- oops. Still, the project was entirely successful! I present to you the Inklings Community Book Collection for March – Diversions, Distractions and Diabolical Deeds: Entertainments for a Darkened Room, in honour of Earth Hour. Monday I had the privilege of attending a lecture at the Royal Ontario Museum called “Canadiana Treasures from the Rare Book Collections of the ROM”, given by the head of the library and archives, Arthur Smith. Not surprisingly, the ROM has some really priceless holdings, including the 1613 Les Voyages of Champlain, Des Barres’ Atlantic Neptune, 1st editions of Susanna Moodie’s Roughing It In the Bush and more. In many cases they have books in conditions unmatched anywhere in the world (not always hard to do, considering many of these books number less than twenty in the world). One work, though, really stuck in my mind because of the story associated with it, and that was the ROM’s copy of the 1866 Buch das Gut, enthaltened den Katechismus, Betrachtung or, as it was introduced to us, the Mi’kmaq prayer book. This is a fat little book of prayers written in Mi’kmaq hieroglyphics, this edition printed in Vienna. Unlike the other books we saw, the prayer book was not at all in good condition. 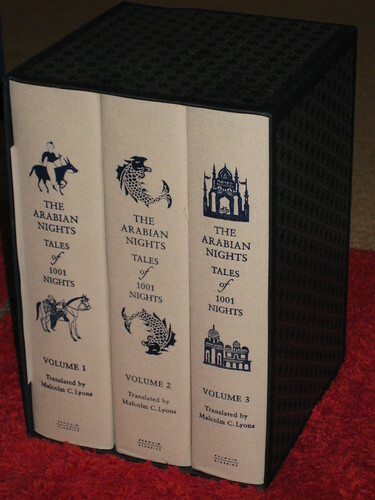 The leather covers were falling apart, the book had been written on and the pages appeared largely unbound. 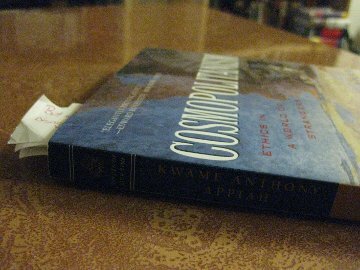 Indeed, Smith noted that the book had been found “languishing in a Toronto auction house” because it was deemed to be in too poor a condition to be of any value. A page from the Mi'kmaq prayer book - but not the ROM's copy. But the ROM bought it anyway. As the story goes, the shipment of these prayer books from Europe was largely lost at sea, and so very few copies remain. A dilapidated copy is still a copy, valuable even in this condition. 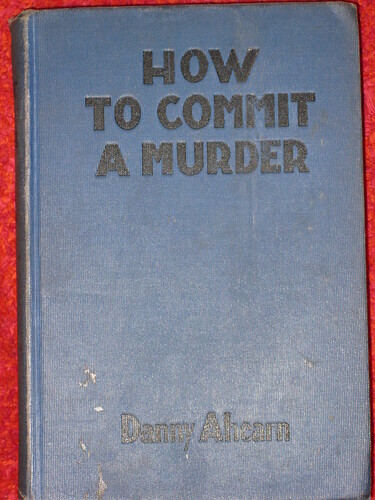 The librarian went about contacting the owners of the other known copies (exclusively, as far as he knows, institutionalized) to compare his, and found that the ROM’s copy was the only one in the “damaged” condition. Pity, right? As it happens, not such a pity after all. The origin and use of Mi’kmaq hieroglyphs, as it turns out, is a source of some contention. This story goes that a 17th century Catholic missionary witnessed the Mi’kmaq using porcupine quills to press shapes into bark, then adapted and expanded this system of shapes into a written language that could accommodate Catholic prayers. This story is thought by some to be apocryphal, and they argue that the “language” was invented entirely by the Catholic church, and no actual Mi’kmaq read it. Except that some, very evidently, did. The evidence is all over the ROM’s prayer book. The geneology of the owning family is carefully inscribed on the first page, and the book shows evidence of repeated readings throughout. The value of this book is in it’s poor condition, in the use and character of this individual copy. Not every book can be hoarded and not every copy should be archived, digitized, conserved. But sometimes it’s worth remembering that there’s more to the value of a book than the printed contents in their idealized form (sorry, bibliographers). There’s as much story to be gleaned from the marks, wear and scars. From the ghost, as they say, of the “hand that touched the hand”. The ROM library and archives are, incidentally, open to the public for research. You can’t withdraw books as in other libraries, but you can use the University of Toronto library system to search the museum’s holdings and can request and inspect the books in the museum’s reading room. The Incredible Instant Book Collection! The headline seemed almost absurd to me. Who has that kind of money, especially nowadays? Aren’t the ultra-rich getting out of these sorts of frivolous things? And if some rich person were willing to suddenly want an instant book collection, why would they want a genre collection, rather than something more prestigious, like Booker winners, or Nobel winners? Who on earth is this being marketed at? I’d almost dismissed it as a curiosity when I happened to notice that one of my favourite local booksellers, Contact Editions, is also, as of this month, getting into the sale of complete collections. Something is going on here. This is some kind of new thing. Or rather, this seems to be a resurgence of an old thing. Rich and influential people have long looked to own personal libraries as a mark of wealth and social stature. Any specific interest in books was less of a factor in the accumulation of these collections than the prestige of owning them, and so secretaries and dealers were often employed to put together “instant” collections for people who were more concerned with the look and value of the books in their library than their contents. But we’re a long way from the Gilded Age, and a good library doesn’t impress these days quite the way, say, a 120 foot catamaran will. Beyonce and Jay-Z drink champagne on the deck of their boat, not the fat armchairs of their libraries. And we’re hardly in an economic climate that suggests hoards of new millionaires looking to buy into the hobbies of the rich and powerful. So? I think the answer is in the motives of the bookseller rather than in the emergence of a new market, and this alarms me. We’ve all heard that we’re in the middle of a mass bookstore culling, with independent booksellers dying off in waves first to the emergence of bookselling superstores like Borders & Chapters/Indigo, and then to online sellers like Amazon, but nowhere is this more true than with used and rare booksellers. Theirs is a more specialized product, and in a book world growing more and more towards reading as a temporal activity rather than books as an expression of permanence, they’ve been closing shop in droves. Not that used and rare booksellers are vanishing – they are simply closing their doors and moving online, to catalogue sales and “by appointment only” availability. They’re focusing once again on their specialized audience, the privileged buyer. The privileged buyer collects books in a particular way. To a large degree, they want the end product, the collection, more than they want to engage in collecting. The collection is an investment or a trophy, something to relish having but not necessarily getting. Many of these buyers represent institutions – universities or libraries – and use booksellers as a sort of outsourced scout or broker. They don’t need, necessarily, to see the book. They can form a list of what they’d like to own at home, then have someone else hunt them down. They pay the asked price and have a library to show for it. And so, yes, selling collections ready-made through catalogues or websites works, because it wasn’t as if these buyers were every going to go spelunking through the dusty old boxes in a bookseller’s overstock room anyway. This is “book collecting” to the extent that paying a mortgage is “house collecting” and it makes me really sad. Yes, many of these wealthy book collectors are true book enthusiasts who take real pleasure in receiving that phone call from their dealer telling them they’ve located a rare book that the collector has long lusted after. But almost every one of those collectors started as a younger, less affluent person who honed their taste for books by encountering the real thing in public, open bookshops. Nobody learns to love books on the internet. And there will be no market for “full collections” if bibliophiles aren’t able to first whet their appetites by discovering individual volumes. We’re not likely to revert to being a society with a rich, Oxbridge-educated elite who monopolize and sustain the rare book trade and so any trend towards selling “collections” seems to me to signal one of two things: either booksellers are going to find themselves with fewer and fewer customers as their old customers die off, or else the rare book trade is going to become the private scouting arm of institutional libraries. Is this a desirable future? I don’t desire it, being a not-wealthy, young, non-institutional collector. Am I alone in that, I wonder? Ain’t that the truth! Of course, the last time I hesitated to bring a book with me on vacation was last month, and it was History of Reading that made me pause. We had a 5h train ride to and from Ottawa so something a little weighty was called for, but I was afraid History of Reading might mark me as a student. In the end, I decided that any impression of being a student would be offset by the presence of my 7-month-old daughter, so Manguel narrowly made the cut! There’s a lot of fuss and bluster in book circles about digital book technology like the Kindle which I am not going to weigh in on in any serious way because I have not actually ever handled an ebook reader and I am not entirely sure what capabilities they do and do not have. That said, I was sorting my books yesterday (something which happens on a semi-regular basis, as it brings me great pleasure) and wondered how I would replace my written “tags” if I were to convert for whatever reason to an entirely digital library. The Kindle has a little keyboard on the bottom, I see; while my mother confesses to printing out pdfs of texts in order to annotate them. Neither of these solutions entirely appeals to me. Most diligent readers keep track of their thoughts on a text as they read. The most common habit these days is to keep notes in the margins of a book, creating a gloss to the text that is referred to as “marginalia”. I find attitudes towards marginalia vary significantly between readers.My own opinion is that unless you are or are intending to become Samuel Coleridge that you should keep your notes in a book to a minimum, but my squeamishness towards defacing books doesn’t seem to be shared by the legions of bold, ballpoint-pen-bearing readers that populate, especially, academic libraries. Yes, the marginalia of great readers and writers can be fascinating, and a source of some really excellent criticisms on a text. But I can’t stand the unintelligible scribblings of former readers scaring my book’s pages, and I do future readers the favour of keeping my opinions out of their text as well. But that’s just me. That isn’t to say that I don’t keep conversation with my books. I waver between two techniques, though one is more of a bad habit than the other. 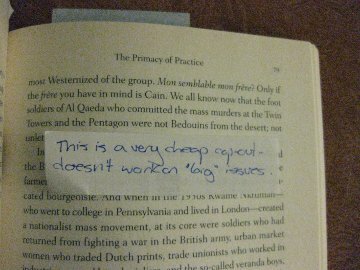 The first, the bad habit, is to note my commentary on little scraps of paper that I leave marking the pertinent page. Many of my books are marked with enough of these little scraps that they look like they’ve got little paper pigtails. This leaves my books clean, and certainly helps me find important pages quickly. But unfortunately my notes also tend to slip out of their books, leaving important passages forever lost. I spent too many hours out of last month trying to find a quote from Robertson Davies on the importance of reading Dumas to young boys that I *swore* I’d marked. This is, however, something which margin-scribblers must struggle with as well. Knowing you’ve seen something somewhere isn’t enough of a roadmap to finding a note in a library of books. My other habit is to keep a notebook at the ready while I am reading, my loci communes. This is an old practice with pedigree and some wonderful perks. Not only can you look back to what you were thinking when you read a book, but you can organize your notes however you like – perhaps keeping a section for favourite quotes, another for future writing ideas, or collections of information pertaining to specific subjects. Writing an essay on Emerson? Maybe you’ve been keeping a notebook of thoughts and quotes pertaining to Emerson, that roadmap to your library. But open-ended organization of your thoughts isn’t the only benefit, nor is the fact that your books will stay fresh and clean. These notebooks become wonderful additions to your library. Me, I am a sucker for snazzy little notebooks. I’ve been drawn to blank notebooks ever since I was a kid. They were pre-bound novels in potentia. 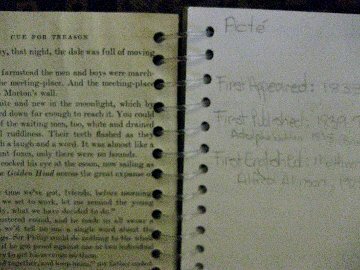 A story handwritten in a notebook was automatically a published book, thought eight-year-old me. 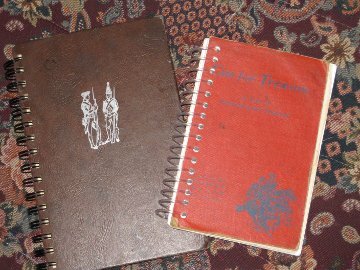 And weren’t spell books in all the stories just handwritten books of arcane recipes? These days I buy notebooks with almost as little restraint as I buy books because Toronto seems to be overflowing with talented paper artists. I’m especially partial to these little numbers: notebooks made from recycled old novels. Even a dedicated book hoarder like me has to admit that there comes a time in a book’s life when it has no future except in the recycling bin – but wait! I’ve seen these journals called “upcycled journals” – you can even get ones with old board games (Scrabble, anyone?) or VHS slips for covers. How cool is that? Maybe the biggest perk of my loci communes is that, in any future ebook apocalypse, they remain useful and relevant. The electronic versions of marginalia and tagging still have their shortfalls over the real thing. Scanning a book for the visual cues notes and tags offer becomes difficult. Search functions rely on memory, rather than aid it. And does an electronic scroll have the margin space available for good notes? Perhaps they could (or do?) offer a function to watermark notes over the text – hell, they could allow you to save the annotation as a separate file to overlay any copy of your book. Torrents of professional annotation, anyone? Forgeries of celebrity marginalia? There’s leeway for some interesting speculation here. But none of it makes me feel quite as secure as knowing that, in the event that I were trapped in a world with only an ebook reader and a good craft fair circuit, I could still furnish a library of worn cloth covers, good paper and sewn bindings, filled with the memories and impressions of a lifetime of reading. It certainly beats sheafs of unbounded printed pdfs!